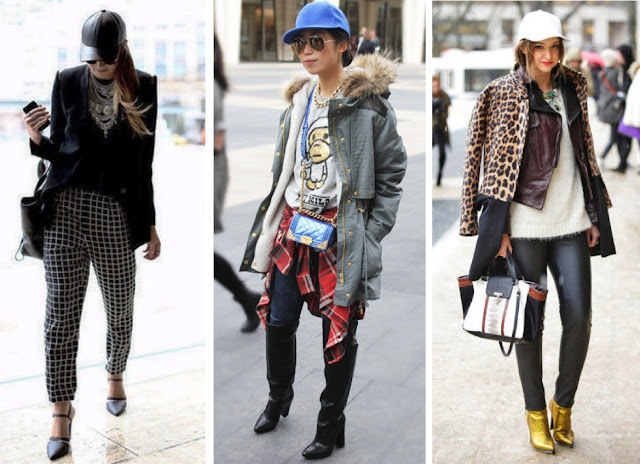 Hats off, or rather on, to the fashionistas heating up the snow storm that is New York Fashion Week Fall 2013. From fur hats to leather caps, as a hat girl I couldn't be more pleased to see such a wide array of fantastic head gear. Gotta love the juxtaposition of a casual striped knit cap mixed with a dramatic fur coat. Identical striped beanie here. Floppy fedoras have to be my absolute favorite style of hats at the moment. They are the perfect mix of downtown chic and boho. I plan on wearing this style now through the summer and into next year. From burgundy to black to camel, you really can't go wrong adding this accessory to your wardrobe. Street style darlings have proved that headgear is the key to fighting winter hair blahs, so I've spent time finding some of the coolest headgear on the market. And bonus points for all the fab hats on sale! Oh I love all the baseball caps! I need a chic baseball cap...how cool! Hats were seriously needed and I spotted some incredible ones in Lincoln Center. Lovely round up! Hats were definitely a MUST the past few days...luckily these are all so cute and chic! i love how the styles are so different! Im obsessed with hats! Love this! So cute! I love that purple hat. I really love the first one!! So warm and cozy. I think we should all wear more hats. They are an easy way to make a statement. love these hats look! brrr it looks so cold! Awesome! I love hats, and I love street style photos! These girls are all fantastic! Lovely post and blog! I'm your newest follower! Would you mind checking out my blog & following back via GFC and Bloglovin'? Looking forward to your next post! I love the commentary on hats! I love love love them all! The last time I went shopping in NYC, all I bought was a floppy fedora in SoHo!! Your previous post of anna w and nick m is adorable~ priceless contrast! All are looking so cool in hats.. Nice stylish look on street road.